Kenneth Murray was one of the three early pilots to serve in Korea ( after World War 2 experience) and flew the greatest number of missions (333) of all the United Nations pilots in Korea. He was later the Chief Test Pilot for the RAAF before being medically retired after a distinguished and gallant service history. In 1950 I was posted to 77 Sqn Kimpo, Korea, after a three month Operational training course at Williamtown, NSW, on Mustangs and Vampires. Sgt (Later F/O) Phillip Zupp, in Meteor "Black Murray." Sgt. Zupp did one Korean combat tour, and completed 201 missions. His son, Owen Zupp, is today a Qantas pilot. Kimpo was a US Air Force Base with all facilities presumably provided by them. We lived four to five in a tent with a wooden floor and central heating was provided by a pot bellied stove. This must have been reasonably effective because the only time I remember the bone-numbing cold was sitting for an hour or so in an unheated aircraft when on stand-by for action. The pot-bellied stove was in operation day and night and when someone absent-mindedly left a can of baked beans on top, caused it to explode with a loud roar. The occupants all dived further under the blanket to avoid a cascade of hot beans but nevertheless they completely impregnated the inside of the tent which had to be replaced. A more successful cooking venture was a succulent stew whipped up by one of our operation officers, who considered himself quite the hunter and bagged what he could hit in the way of birds. The airfield was constructed of sheets of metal mesh (PSP - pierced steel plate) and apart from one Navy pilot who touched down and pulled up the metal sheets of the runway behind him in curls like the lid of a sardine can, it served its purpose very well. Pilots were briefed the night before on what missions were to be flown next day. These usually involved about sixteen aircraft (Meteor 8s) which took off in finger four formation. This allowed the wing men to cover the leader and each other in the event of an enemy aircraft attack. Take off time could be anywhere between first light and last light. On my first tour of duty I was engaged in fighter sweeps patrolling north to the Yalu river. We also provided fighter cover for bombing raids initially by US B29s then B26s. Our main protagonists were MIG 15s flown by Russians - skilled pilots in a superior aircraft. We could only hope for quick delivery of Sabre jets, which the Americans were already flying, in order to even up the odds. We were involved in many dog fights, begun by whoever had the greatest advantage and though we shot down a few MIGs they got more of ours. Strict radio silence was imposed but not always observed. One excited outburst from an American pilot who was hit drew the laconic comment in a plummy Oxford English accent, "Oh, shut up and die like a gentleman!". Fortunately it didn't come to that and the American returned safely to base. The plummy accent belonged to one of the RAF pilots seconded to 77 Sqn and as we all dined with the Americans in the Officers mess relations were really quite cordial. The food was excellent and with the help of the nurses they hosted some great parties. The RAAF ground crews did a wonderful job under difficult conditions readying aircraft for operations. As there were no hangars, the aircraft were parked on the flight lines at the mercy of the elements and often had to be swept clean of snow before any work at all could begin. I don't recall too many missions aborted due to weather conditions but obviously there would have been some. One of the difficulties in Korea was being able to locate the targets for rocket attacks and I firmly believe that my success in this area was because of my previous training as a navigator. I guess I was pretty luck to escape unscathed, on one rocket strike the target blew up underneath me and on another occasion my aircraft was damaged by cannon fire from a MIG but I made it safely back to base. One thing I am glad about was that I was never called upon to evaluate the effectiveness of the immersion suit we had to wear as a precaution against ditching in the sea. The low temperatures ensured that survival time was two to three minutes and the immersion suit was supposed to extend that time long enough for a rescue to be effected. Every six weeks 77 Sqn pilots would fly their aircraft to Iwakuni for servicing and bring back new ones. This two day break gave us a chance to catch up with friends and visit the town of Iwakuni. The Mess had been the setting some time before for a rather famous incident involving General Robertson ("Red Robbie") and a 77 Sqn pilot. The boys were letting their hair down one evening playing "Fighters and Bombers" and pilot "X" was perched in the rafters of the hut waiting to dive bomb the next person through the door. To say that the General was annoyed at being felled by the not insubstantial body of pilot "X" would be the understatement of the year. The festivities came to an abrupt halt. Pilot "X" was banished, paraded before the CO next day and promptly demoted. Laundry was done on an "ad hoc" basis being sent to Iwakuni in a kit bag and processed by your designated Japanese room girl for a small fee. The girls were honest, efficient and obliging but to our dismay seemed to consider darning socks to be a work of art and so decorated our black woollen service socks with repairs in red, blue or whatever colour wool came to hand! The technicolour monstrosities lasted forever and caused a great deal of comment on our return to Australia. After 195 missions in my first tour of duty I was "medivaced" out of Korea with glandular fever and spent a month in hospital at Iwakuni. On release I was given two months recuperation leave in Australia. When I returned to Korea for the second time the operational tasks were mainly rocket strikes and we found that the MIGs were being flown by Chinese pilots rather than Russian as evidenced by their radio conversations. They were not as skilled as the Russians which gave us some advantage. 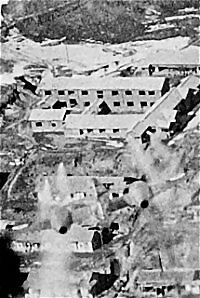 The Chinese forces on the ground used to move around at night and take shelter by day in the local villages, so they were rather difficult to find. It did not deter them however from shooting at us with rifles when we dived down to take a closer look and occasionally they got lucky. 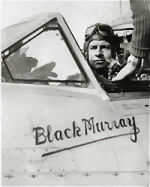 During his second tour of duty "Black" Murray was commissioned and became a Pilot Officer. He had been awarded a Distinguished Flying Medal (DFM) and American Air Medal as a flight sergeant and later was awarded a Distinguished Flying Cross (DFC) as a Pilot Officer..
Whilst the American pilots flew 100 Combat missions before going home, Wal Rivers and I managed to clock up 319 and 333 respectively. Whilst I was in Korea, 77 Sqn lost 45 pilots, including some who were taken prisoner and later released, and even more aircraft. The pilots included many young men from the RAAF Academy at Point Cook and who, in hindsight, were insufficiently trained in combat. They also included many good and valued personal friends. Korea is probably the last theatre of war where the type of air to air combat we experienced would occur. The Korean War has always been considered by some as a mere police action under the auspices of the United Nations and downgraded as a result. For all those involved, it was a matter of fulfilling Australia's commitment to the UN and they responded with alacrity , courage and honour to its demands. I personally think that the outcome was successful in that it stopped the Communist advance south for some 40 or so years. Whether in the light of recent events it was worth the cost in human lives, remains for posterity to judge.